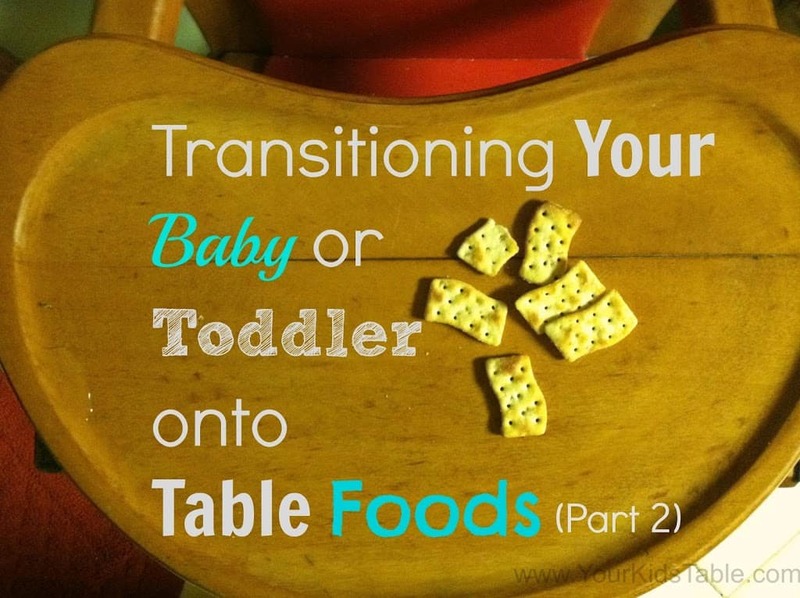 This is part 2 of transitioning your baby to table foods, since I had so much to say on the subject! In the last post, I taught you how to start off with puffs and moving to soft cubed foods like bananas and cooked vegetables, if you missed it, check it out here. 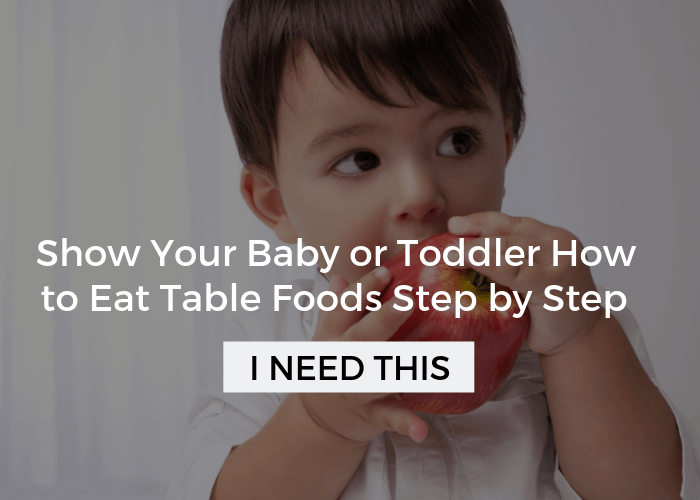 In this post, I will lay out how to completely make the transition off of baby food, avoid choking hazards, and what to do when it isn’t going well. And, look out for the free printable cheat sheet if your baby is having a hard time transitioning to table foods at the end! After your baby has had some practice eating, in most cases a few days, start to regularly serve at least one crunchy but meltable food, like puffs or Towne House crackers (Trader Joe’s Social Crackers are another option if you live by one) during meals. Encourage your baby to feed themselves these finger foods, but certainly give help as needed. If they are eating these types of food well, it is time to move onto some softer foods that require a little more chewing, as we talked about in part 1 of this series. How do you know they are managing (eating) foods well? When they are chewing it with little to no coughing, choking, or gagging, and swallowing easily (not hard gulps), consistently, for a week or two. Some examples of softer foods to move onto are (increasing in difficulty): avocado, banana, scrambled eggs, boiled potatoes, muffins, pasta, deli meat, cheese. At this point you can also try pairing crackers and other crunchy foods with spreads like jelly, hummus, and cream cheese to maximize exposure to table foods and different textures. Spread right on the cracker or show them how to dip it into a glob on their tray. Then, start giving them these foods first, before the baby food, at a meal and allow them to eat as much as they want or will. If you feel they haven’t eaten enough of the actual table food then give them some of the baby food. Keep in mind that babies need to eat actually very little and a tablespoon or two of finger foods may be plenty for them. If you’re nervous about how much your baby should be eating, check out toddler portion sizes, the info is great for babies too! Continue to present a larger variety of table foods slowly and as they eat enough of them give less and less baby food during the meal. There will come a meal when you will say, “I think they ate enough of the toast, eggs, and strawberries. I don’t think they need the baby food.” Once you reach this point, it is okay to dip back into baby foods for a meal here and there, but ultimately you have to take a leap into letting go of the security baby food gives. Keep trying different table and finger foods. If you are looking for finger food inspiration, see my Mega List of Table Foods. I have been mostly focusing on actual cubed food that babies can easily feed themselves, but as they eat those softer foods and the spreads well, you can start to slowly experiment with mixed textures like soups and casseroles. Again, you will want to keep this slow, maybe starting off with macaroni and cheese, and then moving to spaghetti and meatballs and then chicken noodle soup. The latter has a lot more changes in consistency in one bite of food. You can give baby a couple of pieces on the tray of these types of food, but will probably be mostly feeding by spoon. Let’s sum up everything we’ve talked about in this saying bye bye to baby foods series with a list that you can use a quick guide. Remember to ONLY move onto the next step once your baby is safely and consistently eating the previous step for a few days to a week or so, depending on your comfort level and the time it takes your baby to learn, which varies widely. Give soft foods that you’ve cut into a small cube. Give soft foods with irregular shapes like scrambled eggs, noodles, and ground meat crumbles. The best way to present most of these foods is in a small cube shape. This will make it easier for them to pick up and control the size of the bites they are eating. Babies will often choke as they are learning to eat, it is normal, but we can minimize risk by giving them smaller pieces until they are ready to manage more. Puffs have next to no calories. They are great to use when they are just starting on table foods, but as you pull away from baby food they don’t offer enough to fill their little bellies. I am using the word “transition” intentionally. 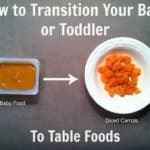 Getting your baby onto table foods is a process that is a little like a dance, taking a few steps forward and then one back. Many parents find this to be a challenging time. Hot dogs, grapes, marshmallows, large dollops of nut-butters, nuts, lettuce, popcorn, hard candy are all potential choking hazards. Hot dogs, grapes, and marshmallows can be cut into small pieces. Spread nut-butters thinly on foods. 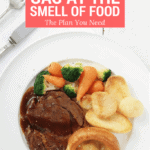 Food larger than a pea could get lodged in the airway. Some children have a hard time moving onto table foods. Often these babes were pros at baby food, but turn their noses up and refuse many or all table foods. It is common for this to be related to sensory defensiveness and/or difficulty chewing. 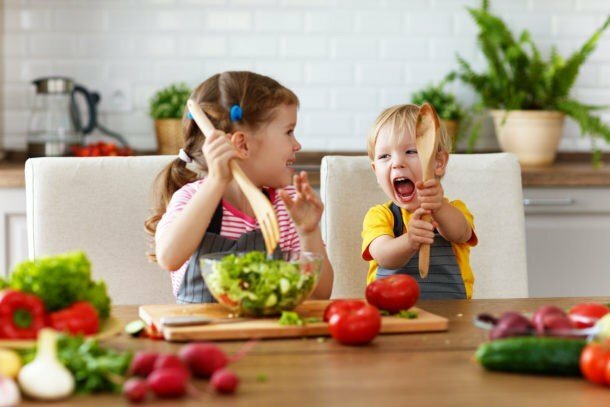 Generally speaking, as every child has specific instances and circumstances, it would be helpful to encourage play with food. 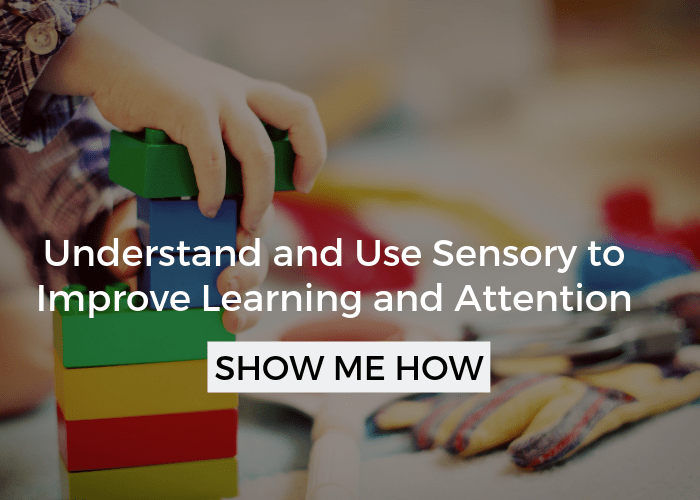 If there is sensory defensiveness, this will help break it down. Try bins of dry foods like rice, beans, and birdseed first. As they tolerate this, move onto wet bins such as cooked noodles (Check out Sensory bin ideas and instructions). Depending on the age of your child, this will require close supervision. Also, try playing with their food during a meal. Take the pressure off of eating and make a game out of those bananas they won’t touch. See Exploring New Foods for more help on this. Lastly, your baby watches you closely and will be motivated to imitate. Show them how to chew by leaving your mouth open and dramatically chewing for them to see. Be positive about foods they try, even if they refuse or spit it out. Keep presenting it over and over, at least 12 times. And, if your baby allows you to, place small bits of food (at whatever table food stage you are in, see the list above) directly onto their gums, where their molars will be. Some babies have a very sensitive gag reflex if that’s the case head to What You Need To Know About Baby Gagging, you’ll find tips for how to overcome and when to know if it’s a problem you need help with. If you continue to struggle with moving forward with this process, consider feeding therapy. If you are in the states you may qualify for free help from Early Intervention. Do you feel like your ready to tackle table foods? Still Have Questions? Get the Free Printable! I totally get that when your baby or toddler isn’t eating table foods it can feel super stressful. That’s why I have the free Learn to Eat Table Foods Cheat Sheet printable . I’ll send it right to your inbox. Click here to get your free printable and put those worries to rest. There’s a lot of info in this post, you might want to get to it quickly again later! Hi Alisha! This is such a great blog. My 12.5 mo is doing great transitioning to solid foods so far – she eats small pea sized bites of soft veggies, avocado, banana, grated cheese and shredded or small diced meat. When will she be ready to bite off something and get the right size amount in her mouth to chew and swallow – I’m wondering specifically about breads and crackers. When you say t introduce crackers (graham or Town House) do you mean breaking them up into small pea-sized amounts? If so, how do you spread things on them? Thank you! I spread first a thin layer and then cut it, a lot will turn into crumbs, but the pieces about a pea size and a little bigger I put on the tray. I’ll also help them pick it up if they need it! Thanks Alisha! I’ve been spreading hummus on bread and cutting it up a lot. Just curious for the future, at what point will I know she’s able to pick up a larger piece and take a bite off of it? I usually test a strip of toast or bread and help them the first few times with close monitoring. I don’t try this until I can see they’re chewing well though. Looking for help for my 1 year old. She did so well with purée food and eating in her high chair, even ate probiotic oatmeal every day! Around 10-11 months starting getting fussier and fussier in her high chair and all out refused the spoon coming at her despite my best attempts and even letting her hold the spoon. She was started on Gerber Puffs around 8-9months and did well…we slowly started working different things into rotation, but sometimes she will eat 1 bite of table food, sometimes she will eat 10! One day she will eat something, the next she won’t. We usually have about 5-10 minutes in the high chair before she starts slamming her tray and swiping things off in an all out tantrum! What do I do?! I’m also nervous about weaning weaning formula because there are some days I feel she eats nothing at all! This is tough for sure, you might want to look into early intervention, just to make sure nothing else is going on, but one thing I’d check in on is your schedule. Do you think she’s hungry? If she’s having milk right before she might not be. My son is 19 months old and is currently “transitioning” from purees. However, on occasion, when he is eating his pureed lunch (which consists of vegetables and meat), if it is not completely pureed and he finds a piece of food like carrot etc in it he starts gagging. So I have to be very careful with pureeing the food. How will he ever be able to eat a dish that contains different consistencies (like the chicken noodle soup you mention, or even yogurt with fruit pieces etc.)? Yes, stage 3 foods that have pieces in them are actually more difficult because they have to sort through the little pieces. He needs to learn to eat other foods before he’s managing the pieces well, if that makes sense! Hi! My son has just turned 11 months old, his is typically developing and loves to play in his food. He used to eat all kinds of baby food but since transitioning him to table food he has become very picky. He will only eat soft breads like pancakes, french toast or waffles. He will eat any fruit, PBJ sandwiches, and some potatoes. Im having a difficult time getting him to eat any vegetable or any meat. I am feeding him table food for Breakfast and lunch and stage 3 baby food for dinner. I feel like he is beginning his life with poor eating habits! Do you have any suggestions on how to transition him to a wider variety of foods like meats? This is actually more common than you think, although frustrating. I have this recipe on eating veggies and this one on eating meats that I think will be really helpful! Thanks so much for the info! It’s very clear and practical amongst a sea of information on the internet about babies and feeding. I’m just wondering, when you say to cut soft foods into small cubes, about what size is this? A cube small enough for them to put into their mouth all at once, or big enough that they can’t put it all in their mouth and have to take bites out of it? It’s probably obvious but I’ve been a little confused. I have an 8 month old who skipped the baby food stage completely. He’ll take pureed food really well every now and then but much prefers the texture. Thank you in advance! You want the cube to be cut small enough to fit into their mouth at one time. This will also help lower the risk that the would choke on the food too. Thank you for your post. My son is 9.5 months old. Since one month or so he eats very well. A couple of weeks ago I started to give him some table food and he manages it very well (although he has still no teeths!). I gave him bread, lentils burgers, little meatballs, polenta sticks, some steamed vegetables. He still struggle with fruits, so I put tiny pieces of fruits directly in his mouths. My question is the following. Usually we give him pureed food at lunch and table food at dinner; at breakfast sometimes purees sometimes bread. When I am at work, he is with his grandmother, and she gives him only pureed food (I don’t feel comfortable with her giving my son table food, as he’s beginning with it). I wonder if he could feel confused, as sometimes food is pureed and spoon fed, sometimes there are pieces… I’d like to get rid of pureed food by 12 months. I also struggle to give him proteins, carbs, vegetable each meal. For example, at dinner, how could I give him meat or fish? He’s still improving his pincer grasp and I don’t feel comfortable to give him meat without teeth. Any suggestion? Is it bad to help him feeding himself? I mean, putting tiny pieces of food in his mouth if he isn’t able to grasp them. It’s absolutely fine to help him feed himself, and at his age, I don’t think he’ll be confused. You could include purees with meat, but don’t have to yet. You want to be working towards meals that include all three food groups. Keep in mind, babies don’t need teeth to eat, of course not a steak, but tender pot roast – once he’s chewing a variety of foods is totally appropriate! You’re on track! Good job!! Thank you very much for your kind reply. I have the impression that he prefers pureed food, because it’s easier to eat. In the last few days he has refused to eat breakfast, as I have only offered him finger food. I was wondering if he was already full or still sick (he was sick last week), but today, after having offered him soft homemade oat cakes with no success, I have offered him cream cereal for breakfast and he has eaten it without any objection. The transition won’t be as easy as I tought. Hi and thank you for this helpful information. My son is 11 months old. He is interested in eating from 6 months, and I startedbwith BLW as with my daughter even but I’ve offered him babyfood occasionally. But even though he loves to put things in his mouth (food, papper, toys) and he chew on veggies, baby biscuits and ect., he never swallow. He takes a bite, chews and spits. If something goes to his throat most of the times he gags. He eats breastmilk mainly. Unfortunately in my country we don’t have food evaluation and such. I took him to speech therapist but he hasn’t found the problem yet. We decided to reduce the times that I breastfeed him in order to keep him a bit hungry but it didn’t work so next thing was to start all over with stage 1 babyfood but he doesn’t want to try it. He spits all types of puree. I’m trying to understand whether is something sensory or gagging problem but can’t figure it out. I would be grateful if you share your thoughts. Hi Vanya, it’s hard to say exactly what’s going on, but something sounds like it is… my guess would be sensory. Did you see in this article about using a toothbrush, I’d definitely start with that. Swallowing is a skill in an of it self. I like to offer a drink before they spit out- if that makes sense! Did you see the free printable in this post, I think it will be helpful. Hi, I started with the toothbrush a while ago, and now I’m trying to offer water. But meanwhile we have a breakthrough: one day after he has refhsed his babyfood again I started to eat my lunch (fish soup) in front of him and he ate a couple of veggies with the liquid. That’s how I discovered that he likes to have pieces in liquid in his food. So I started from that. And now he’s better with swallowing. He eats tablefood and is getting better and better in chewing and swallowing hard pieces (a few days ago ate a little apple). Still doesn’t like puree and mashed textures though. Your blog was really helpfull for me. And I would like to thank you again. Best regards! That’s so great Vanya! I’m glad you are starting to see improvements! Hi,I am a first time mom of 18 month old boy.He achieves his all milestone a little late.He started walking at when he was 15 month old.The main issue is that he never never put any thing in his mouth himself even his teether or toys..He never hold his feeder or sippy cup.He does not eat himself any thing.He is a good eater and eat everything but by my hand.I try everyday to put puffs,fruits ,crackers in his tray but he only play with them,crush them with his fingers and then throw everything. What do you think?Is it some medical issue?.My mom says that he will learn eventually but i am worried.Any advise would be appriciated. Hi Alisha – I have a 15 month old who still eats pureed food. She will eat a bit or two of the table food or the puffs that melts in the mouth and then throw everything away. I tried giving her toast with Peanut butter and banana circles today . Please advise how i can move my baby to eat normal food. Thanks so much for your blog. I have a 10 1/2 month old girl with a super strong gag reflex. We are now onto beginning stages of finger foods. She will only eat happy baby yogis broken in half or puffs. She won’t let me spoon feed her anymore and I don’t think she’s getting enough to eat. I try different food at each meal. I let her play with the food. I am positive and encouraging. She still has 24 oz of formula daily. Any advice or just keep trying? Thanks so much for putting together this website! We are trying to advance my 20 month old daughter to table foods. She has had reflux from birth and did not start having any solids until after her first birthday. When we tried to advance her to finger foods, we noticed she was just swallowing everything we gave her (sometimes she choked and threw up and we saw the pieces of food were the same size that we gave her). Then she just started keeping everything in her mouth in her cheek and wouldn’t swallow. Now we have her back on purees again. I saw your post on how to advance babies to table foods and since a week ago have been offering her puffs with her purees. She picks them up herself and puts them in her mouth. However, I don’t think she is chewing them. She moves it around in her mouth and just waits for it to melt and then swallows. It has been a week and she has not gagged or choked on them but she doesn’t seem to be chewing them either. So based on this, should I try to advance her to step 2 or wait longer? 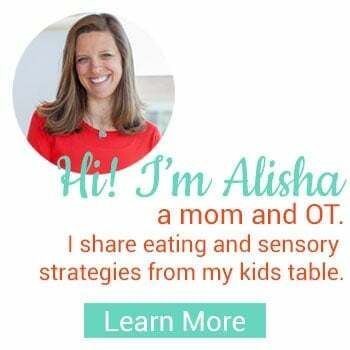 Hi Alisha – first off, thanks so much for the information on transitioning to table food – this has been the most informative blog I have read so far. We are very interested in helping him make a safe transition to table foods, as he is very eager to feed himself, but we have a few questions. With each of the pureed foods we introduced, we were instructed to keep a few days to a week before introducing the next pureed substance to screen for food allergies. We’ve been blessed, and not found any issues thus far, however we were a little unsure if the same process holds true for table food (waiting between each new food), as table foods tend to have more ingredients, and obviously he hasn’t been introduced to EVERY food in the pureed form. Any light you could shed on this would be greatly appreciated, thanks in advance! Thank you for your kind words! I’d say to go with your comfort zone, I’m sure some doctors recommend the wait and see for three days. And, since you’ve followed it so closely, it might be good to continue, especially the first time you introduce gluten, dairy, etc. Hi Alisha, Thanks so much for the time you take responding to us all here. I was starting to feel very alone on this issue! My daughter is nearly 14 months and still on baby food. Between 8 – 11 months she was very ill with numerous bouts of brochiolitis and pneumonia. In dealing with all of that, we totally missed the transition. We initially tried with some puffs, then teething biscuits, but after her gagging I got too frightened and we went back to puree. Last night I cut up a tiny amount of tomato and gave it to her on a spoon, she gagged then vomited. She didnt seem to chew it at all! I have now found your precious advice and we will try to follow. I was just wondering if, given her age, there are any further steps we should follow or modify? Will it now be more difficult for her? She is able to eat the baby food with lumps but always coughs when using a sippy cup. Also, we live in Switzerland and so I was wondering how to choose suitable equivalent puffs/ teethers as we dont get Gerbers or any of the others here. Thanks so much. I wish pediatricians would give more info on this! I stumbled across your blog a couple weeks ago and am so glad I did. Thank you for sharing all the wonderful information. My little guy is 10 months old. He’s been eating baby food since about 6.5 months and we started him on puffs and yogurt melts around 8 months. He loves his puffs and yogurt melts and has no problems eating those. Over the last month we’ve been giving him some other table food – noodles, cheerios, eggs, ground turkey – and he’s struggling with it. We give him small pieces and he is able to chew everything up, but then he tends to hold the food in his mouth, and when he finally swallows (if he does at all) there’s usually coughing and gagging. I’m guessing we just need to keep at it, offering small pieces at each meal and not putting too much pressure on him to eat what he’s not ready for. When he’s ready, it will just happen. I just worry he’s progressing with it too slowly. If you have any other tips, please let me know! Hi there! I have a 15 month old who is a really really bad eater! (No exaggeration, he really is) He’s been like this since birth. Lack of interest in nursing (used to nurse for a couple minutes and done) or bottle (Getting 2-3 oz done is considered success). We thought it will get better once solids come in by 6 mos; didn’t change a thing. Every spoon of baby food that goes in takes work (distract with toy, singing, iPad). We introduced table food (puffs etc.) a little bit here and there, but he showed zero interest. At 11mo, our ped said we need to take his transition to table food seriously and put us on an exercise of – 1)Stop pureeing food completely, 2) Let him self-feed only. He went 4 full days with zero food (but 12 oz whole milk per day) and then started learning the whole chewing, swallowing thing slowly after that. So, there definitely was progress out of this exercise, but we couldn’t have continued with the zero food situation longer than a week and i got back to giving him pureed food. This time, i started making it chunkier (mixed texture) and he seemed to take it no different than that smooth puree. Currently, at 15 mos, our eating routing is – first, i let him eat his table food by himself and then i feed him the textured puree after he is done. My problem is – he is eating little to none of the table food i offer (i consistently offer it still hoping one day he will change) and thus i end up feeding him the puree. There are 2 things in the table food category he likes – Eggs (eats the full egg) and small berries (5-15 depending on hunger). I am worried how can i continue with such a small variety (not to mention the little quantity). I really cant wait to be done with pureeing/mashing. Please help! Oh and we have already started our early intervention thing, it takes some time and we are in the process. So glad you’re in EI, that’s perfect! Will he let you put food on his gums? Will he eat any of the crunchy, but meltable foods I talk about in the post? If you haven’t tried those I would. I’d also use that demonstration as silly as it sounds. And, another thing that sounds strange, but can be really powerful is I’d brush his teeth a couple of times a day, maybe even before a meal. When you do this make sure you get his tongue and inside of cheeks really well. This will improve awareness in his mouth and can have a big impact on chewing! When it comes to table food, he wont let anyone control that except him. So, no, he wont let anyone put in his mouth. We’ve tried crunchy stuff and he likes them. Problem is – he is done after eating 1 or 2 sticks or half a cracker. How do i encourage him to eat a bit more so that i can count that as a snack or meal somewhat. Demonstration – We do a little bit, but we dont get a chance to do it for every meal. May be something worth considering..
Brushing his teeth – Something we have never tried and I am definitely going to do this next per your recommendation! Could you spread something very thin on the cracker? Maybe a little bit of cream cheese or hummus. As he tolerates that you could put a little more on. Also, make sure you have all the food ready at one time and then just put a few pieces of each food (around 3-4 total) in front of him and sit down to eat the same thing at the same time. It can be a little hard to get into this routine, but it will be worth it! Thanks for all the information. I am having some issues with my 12mo old and table foods. She will not touch proteins or pasta (chicken, beef, pork, hummus, cheese, beans, cottage cheese, and any pasta-even baby star noodles). She does well with yogurt, but I don’t want that to be her only source of protein. She does well with crunchy textures, but seems to struggle with the slimy/soft textures. She will rarely even try bread. She just won’t even try meat/pasta/bean foods. She will play with them a little (which is progress) and then push them away and refuse to try them. Do I just keep offering these types of foods and hope she warms up to them? Any insight would be greatly appreciated. Hey Amy, yes keep offering, follow these suggestions. But I’d also check out this article on sensory processing, follow the tips for using a toothbrush. A lot of babes that are having a hard time moving to other textures are sensitive to them. After reading that let me know if you have more questions! Hi! My 12mo was eating most puréed baby foods that we spoon-fed her, but once we introduced appropriate table foods about three weeks ago, she will no longer let us feed her. This would be great, BUT she barely eats any table food herself — 1, 2 or 3 tiny bits per meal. I’ve tried some things over and over again and others just once. She likes cheese, but I obviously can’t let her eat only that. She was a preemie and is now *almost* up to the 5th percentile for height and weight, so I worry a lot about her nutrition and growth. I totally get it Robyn, do you think she doesn’t know how to eat the table foods yet or does it seem like she doesn’t want to eat them? If it is the former, did you see part 1 of this post, too? It might be really helpful for her to practice learning how to eat these foods like I talk about there. Shes choosing not to try things. She’s a champ with the puffs, and she likes bits of bread, too. I guess I’m just frustrated with seeing the pieces of sweet potato and blueberries and mashed-up beans HIT THE FLOOR when she inevitably rejects them. Perhaps it’ll just take more time? Yes, keep giving her those things, but I want you to try and focus on the crunchy foods. Think about toast, and if she does that then spread a little hummus or avocado on it. Or try some homemade sweet potato or carrot chips for example. You can use this strategy to work towards new foods. Alisha, please help me… My son is 13 months old and because of my fear of him choking and mostly my lack of know how, he is still on baby food. Don’t get me wrong, he has tried quite a few different table foods, just in very small amounts. He does well chewing and feeding himself but I only give him one or two pieces at a time because whatever I put on his table, no matter how much, he quickly picks up every single piece and in his mouth it goes. So I feel like I can’t just make him a plate and give it to him. I desperately need to figure out what to do because at meal times he has gotten to the point now where he refuses baby food and wants table foods, which is great, I just don’t know how to go about it so in turn… I feel like he ends up eating next to nothing. How can I make him a plate and get him to pace himself with it? Any foods/meals in paticular you can recommend? Any advice is greatly appreciated! Hey Kimberly, it actually sounds like he’s doing great and what you’re describing is actually quite common. I’d suggest just having a main plate and giving him 1-2 pieces at a time as you sit and eat with him. I know its exhausting but it kind of comes with the territory at this age. I’m totally okay with that! It is just great to hear that I’m not totally failing at this, lol. Thank you for the much needed reassurance!! I am so happy I found this site. I have a 18 month old boy. He recently went through some bad teething and a sore throat. That’s when he stopped eating the baby food I was making for him. He was a great eater up to that point. In a week he lost almost 4 pounds and we finally got him to drink some Pediasure so he bounced back, but still refusing solid food, totally refusing being fed with a spoon. He starts crying if you insist. We put him at the table with us, he will show interest in some of our food, but not grabbing it to take it to his mouth, you have to offer it. He’s not taking any bites, just licking it. I don’t think he knows how to bite or chew. he’s happy to sit at the table with us, enjoys watching us eat, but still afraid to try. At this point he only drinks pediasure and licks some food. I know I made a mistake of not exposing him to diverse food, but I was happy he ate healthy and organic. What to do to encourage him more? Hi Violeta, he’s probably at an age that he’s really done with pureed, that happens for sure. Of course he still needs to eat some purees(yogurt, applesauce, etc.) Put some of that on his tray, a small amount and enourage him just to touch it, when he does try to get him to take his fingers to his mouth so he can lick it. This is to help him make the connection. Give a spoon and demonstrate this too! I’d also give him large foods like the whole carrot- did you see part 1? You’ll want to focus on him mouthing big foods like that that he can’t bite off. This will decrease his gag reflex, give him exposure to textures, and begin to facilitate chewing. Put those out on his tray and demonstrate too- this may take a couple of times. I’d also recommend brushing teeth, twice a day, getting all over his gums and mouth- a vibrating toothbrush could provide extra input. Lastly, and I don’t say this to freak you out, but if you’re in the states I’d really look at early intervention. That little bit of extra help could make all the difference. If you have any questions let me know! I totally hear you, really. First, I want you to click on the articles tab in the menu bar because I have a series of schedules for babies and toddlers at different ages that I think will be helpful. I would take away the night time feeding last, and follow these steps to have her eating more foods and rely less on the baby food. You’ll want to wean her from that soon. After looking at the schedules, let me know if you need more help. My 9 month old refuses to open his mouth to any purees. We have started on BLW in the last 3 weeks. He is eager to bring food to his mouth but does not swallow. Every time he sees a spoon in our hands he starts to cry. However, he is fine with bringing a spoon to his own mouth. What can be wrong? He exclusively receives breastmilk in a bottle. He is very hungry therefore requested more breastmilk because he does not swallow any food. I am worried he won’t be ready to eat by the time he starts daycare (1 yrs old). Hi Mary, did he have any negative experiences with baby food early on? Is he actually chewing the food and just not swallowing? Have you started tooth brushing? At this point I wouldn’t worry too much about baby food. I would follow all the steps listed in both these posts as well. Also, try putting some baby food right on his tray and see if he’ll bring to his mouth. I don’t want to freak you out, but I think it is best to be proactive- if you are in the states I would look into an early intervention appointment. They come right to your home and it is free. See the article index in the menu bar for more info. Let me know the responses and I’ll give you some directions. My grandson has just turned 1. He has 4 front teeth. He has been breast fed 100% until just a month or so ago. His mom did not feed any baby food or grind any table food she just started with the puffs, when he could grab and put in his mouth she cuts up table food into chunks. Seems like it would just go right thru with no nutritional benefit. What do you think? Not at all, if he is eating a variety of foods than that is perfect! Thanks for your blog. I try feeding my 11+ mo chapati and bread. He loves soupy mashed food because it is easier to swallow, with no need for him to chew. He doesnt even eat a banana or any fruit for that matter, if not given as milkshake. Though he does take the bite of the bread or any solid like cracker and french fries that are offered, he cant seem to swallow it. I usually find it accumulated in his upper palate of the mouth. He then gags and vomits it all out if offered water. Any leads of how to help him swallow/ chew and swallow would help. Hi Ana, I would really follow the steps that are outlined in both part one and part two. You will have to take it slow. He doesn’t know how to chew, and he needs to learn. The older he gets the more difficult that will become. Demonstrate with him and focus on crunchy foods that melt. I’m available for consultations, see the menu bar. Or, consider getting a feeding evaluation, it will be tremendously helpful. Use a tooth brush two times a day, get the sides and top of his tongue. Also, brush the insides of cheeks. Let me know if I can be of more help. What does sensory defensiveness mean? Being sensitive or defensive towards sensory input. For example, different textures, loud sounds, movement, etc. See the tab in the menu bar called sensory basics for more. Hi Alisha. Thank you for the wonderful post. My daughter is 17 months and is still mainly on Gerber stage II baby food. I have tried numerous times to give her Stage III and she literally gag and sometimes vomit. She can eat rice, spaghetti, cheerios, Gerber fruit bars, pancakes, french toast, bread, cookies, banana, scrambled eggs, boiled eggs and pears. We took her to a Pediatric GI recently because she was vomiting after her meals. I would give her 2 jars of baby food and she would eat them with no problem and with no signs of feeling sick. Then from one second to another, all the baby food would just come up entirely the way it went down. Looked like I poured it all over her. It was happening at school too and the teachers were concerned because it was so random. The GI scheduled an upper GI test as well as allergy testing to make sure she isnt allergic to milk, soy, wheat, gluten and nuts. Her blood test came back fine and her upper GI test was normal and the doctor didnt see any reflux but said it doesn’t mean she doesn’t have it. The GI thought it was possible that she may have reflux so she prescribed her zantac. I have been giving it to her twice a day. We also switched her milk based toddler formula to soy (she didn’t do well with cows milk and had diarrhea and vomited). I forgot to mention that she would sometimes vomit after her milk too. The soy seemed to help for a few days but then she vomited at home after a meal. So we have been feeding her smaller portions more frequently which seems to help. But now to the real issue, i really want her to be 100% on solids already. Most kids in her class are eating spoonfuls of rice with fish and other solids and she is still on puree. Her teacher asked that I blend the dinner that I make into a thicker puree and send it to school to see how she would do with it since she eats great at school. We tried that yesterday and the teacher said she gagged twice and didnt want it. So the teacher asked me to make white rice and then puree some meat separately. I did that last night and sent it to school with her this morning. Don’t know how that will go, but I think better. I gave her a bowl of rice yesterday along with a bowl of steamed broccoli and ground turkey and she only wanted the rice. When she managed to get rice on her spoon, she ate the rice well. I did read that I should introduce a new solid at every meal first. I am going to do that. Any other words of advice? Yes, I would keep presenting table foods at every meal. Demonstrate how to chew, also give her chances to get messy and explore her food. Keep meals very positive. There is no pressure, but I’m available for consults- see the menu bar, which I think would be really helpful. Please let me know how things are going, if things don’t start to turn around. Hello, I have a 10.5 month old who we’ve had difficulty feeding since birth. First it was tongue tie which got worst after it was corrected twice. She started refusing breastfeeding at 2 months, gradually weaned until only the morning feed at 6 months until now. She refused all bottles too and so now we are using a syringe getting 10 to 12 oz of pumped milk into her. She has never had more than 15 oz and she is still growing on her curve! Some freaky metabolism. We’ve been evaluated at feeding clinic and has been diagnosed with low appetite nothing else. We now get fat laden solids into her by spoon 3/4 a day on a schedule. It is hit or miss. She will self feed esp. Cheese for a few bites but the rest is spoon fed. This is so exhausting and I’m just wondering have you seen babies like this? I would love to have her on a cup but 4 month trying to no avail. The feeding clinic is not concerned because she is on her curve and have said she will be low appetite and behind in feeding skills until she gets motivated to eat. We have followed all the usual suggestions but she just doesn’t care about food. She never has hunger signals. Any thoughts. I’m writing this here because she is getting near toddlerhood and the portion sizes are just not going to work. She gives us no indication when she is full. We just stop when she refuses. Thanks so much for your blog! I was wondering if you could provide some feedback regarding my 13 month old son. Starting solids was really difficult and it took over a month for him to begin to eat any puréed food. Transitioning to table food has also been very difficult. Like many others who have commented, he does really well with dry snack foods like puffs, Cheerios, bread, cheese puffs and yogurt bites. Any other food that I present to him, he immediately throws on the floor. There has been a rare occasion where he has tried to put a new food in his mouth, but he promptly spits it out. I have been offering at least one non-preferred table food at every meal (like soft veggies and fruit, meat, beans, cheese or scrambled eggs) and he has consistently rejected them for over a month. In addition, he refuses to drink from a sippy cup, but has recently started putting it in his mouth. He drinks about 15-20 oz of milk from a bottle each day. He eats yogurt and purees fruit well from a spoon and will take a couple bites of pureed veggies before swatting the spoon away. I do my best to eat with him, remain calm when he throws food everywhere and cheer him on when he puts something new in his mouth. He has been playing more with food at meals when he previously wouldn’t touch anything “messy.” Do you think this would warrant an evaluation or should I just keep working with him at home? Any suggestions would be helpful! Melissa, what you are doing sounds great and I would continue that, it may take more time. I would look into getting an eval because it can never hurt and at a minimum it will ease your mind. Also, it can take some time to have that set up and in another month or two the situation could still be the same. In the meantime I would really focus on that messy play and expanding on the crunchy foods, give him as many options of those as possible. Babies gag for different reasons and since you just started this may totally be in the range of normal behavior. Gagging can indicate that they don’t like the feel, this usually happens as soon as it touches their mouth, if it is after a while it may be because they didn’t chew it well enough. I would follow the steps I layed out in both of these articles and focus more on the meltable crunchies. Keep trying, but in small amounts- unless you think it is because he isn’t chewing well. In that case I would give it a break for a week or two and then re-present it. My 9 month old has been eating jarred baby food with chunks for a little over a month now. With some i still need to mash slightly. He has also been eating mum mums for a few months now with no issues. Sits in his chair and eats on his own. His pedatrician just gave the go ahead for eating food off the table. I tried cooked carrots and he just spat out. I then tried bananas and he gaged and spat out. I wont try unless someone is with me as im terrified of him choking. I dont know how to transition him without my fears getting in the way. Is he gaging because its a new texture and im just paranoid? How many times do i try a food with him spitting it out and gaging until i give up and try something new? I have a 10 month old boy who is reluctant to place anything in his mouth. I have noticed since he first started picking up toys that he just does not place things in his mouth very much at all. His older brother was always mouthing toys and I have noticed that Ben likes to hold them, look at them and bang them on the floor or other objects but he rarely places them in his mouth. This seems to have translated to the table and eating. He will eat any pureed baby food and is so handsy that I have always had to give him his own spoon just to keep him from grabbing the spoon while I am trying to feed him. He never puts the spoon in his mouth but just looks at it and bangs it on his tray and drops it on the floor. We started giving him Gerber puffs on his tray about 6 weeks ago. He will pick them up, look at them, bang his hand on the tray and drop them on the floor. He loves to eat them and will hold his mouth open like a little bird when he sees them – basically asking for a bite – but he never puts them in his mouth himself. Even if I leave him alone or ignore him, he will get frustrated and cry and when I look at him he will hold his mouth open but will not self feed. He does this with all other table food we have introduced. He eats cooked carrots, peas, grean beans, scramble eggs, bread, pasta that I mash with a fork and feed on a fork or spoon. The only thing he ever gags on is canned fruit and bananas. No matter how small I cut them, he will roll them around in his mouth without really chewing and then try to swallow and gag and recently he has started to cry and spit them out. But while he has trouble with fruits, he has progressed with other foods. I have recently gotten a small food processor and will put whatever we are eating for dinner in it – for example I recently put a couple tablespoons of cheeseburger macaroni and some green beans in it and rough chopped it and then spoon fed it – he loved it! Just last night I mashed some spaghetti with hamburger cooked in the sauce with a fork and he actually cried if I took too long to shovel the bites in his mouth – again he loved it! But he has literally, never put a bite of food in his mouth himself. I have held food out to him and he can take it with his pincer grasp but then will just play with it all while holding his mouth open and crying for a bite from me. It is clearly not an issue with touching the food with his hands or having the food in his mouth but there is some disconnect with getting the food from his hand to his mouth. I am not sure how to help him with this. I have tried putting his hand to his mouth after he picks up a piece of food and feeding it to him off his own hand but he tends to pull away and the food drops half the time, and even though it has gone in a couple of times it doesn’t seem to have made any impact on his behavior. Any other suggestions? You are very intuitive to have noticed that he doesn’t put the toys to his mouth. That is a huge sign to me that he hasn’t made the connection. I would work on this with him outside of meals with all kinds of teethers and toys. Show him how and gently guide his hand to his mouth. If he gets close at all then give him big cheers and praise, this will be motivating for him. When he eats his purees let him get some on his hands and try to quickly get it to his mouth, I know messy, but he needs to make this connection. Don’t force, but keep trying and again give praise for anything he does that is in the right direction. At dinner tonight and before even reading your reply, I did this a little bit with his yogurt. He loves lime chobani yogurt and was really enjoying it from the spoon and trying to grab the container. So finally, I thought – why not? And I let him get it all over his fingers. It took a couple of tries to get his fingers in his mouth because he always fights when you grab his hands – I think he thinks you are going to take whatever he has away. But after getting his fingers into his mouth two or three times and him really responding and sucking on his fingers, he actually put his finger in his yogurt and then directly into his mouth one time for himself! I did praise him and smile and do a little mommy cheer and he was really grinning and having fun. I left it at that and just let him play with the rest of it because he had eaten almost the whole container and I wanted to let him just explore and see if he would put his hand in his mouth again but even though it was only the one time, I was really encouraged. I like the idea too of using toys to try to teach him the hand to mouth connection because I do not want to create any stress around eating. He is an excellent eater and we will just continue to feed him from a spoon or fork until he gets it on his own. I did want to ask, from reading other posts I thought perhaps his issue with canned fruits and bananas is the mouth feel issue – I think I read elsewhere on your site that babies can sometimes have issues really feeling the food in the mouth. Would you recommend doing anything about this right now or just continuing with all the foods he is doing well with and waiting a little longer for fruits? That is great progress, keep building on that. I would keep doing fruits, the more exposure and play he has with it the more comfortable he will be. I would also set up some baby safe textures for him to play in outside of meals like edible playdough or edible finger paints, bubbles, shaving cream in the bath tub, etc. My 19th month baby girl is mostly still on mashed. Although she will eat , rice bread, pasta some friut and veggies, corn puffs, cheese biscuits, etc but not enough to make a proper meal. So I give her chunks as a first course and then a bowl of mash as the main meal as a second course. She is also learning two languages and is starting to say two word sentences so I know she doesn’t have a speech problem. But I’m worried the transition from mash to chunks as a proper meal isnt going as fast as it should. Should I continue this and increase the chunks gradually.? Please advices and tips would be greatly appreciated. Yes, I think you are doing what makes sense and I would try to encourage more chunks. Demonstrate for her with your mouth open so she can see how you are chewing and also try some crunchy foods like I talk about here and in part 2. Give lots of praise for anything she does well! It’s a little 1 in the morning here, and he has officially drank his 3rd cup of milk (had to give it to him, he woke up crying), plus the 1 and 1/2 cup of joghurt. Hi Alisha, help me! I have an 18 month old son who’s been experiencing difficulties in eating. I think he has some sensory issues, or doesn’t know how to co-ordinate chewing. We don’t have OT’s here, and the closest that I have found to a therapist was a logopaedician/defectologist, who disregarded my concerns and told me that if my son can chew potato chips, he can chew anything, and the reason he will not touch bananas or anything mushy is because he maybe doesn’t like them. I also had him evaluated by a psychologist and, guess what, his mental and motor development equals that of a 22 month old. I’ve followed your tips to the word, thickening the purees, and always serving some table food first. He had developed so nicely that we had reached 50:50. But only certain type of table food, for instance, pastinas with some diced zuchinni or shredded broccoli, and cheeses sprinkled on, and deli meat. Nothing runny or mushy! I think I made a wrong step somewhere. About two weeks ago he started refusing being spoon-fed, and he wouldn’t touch the bowl, just finger food. He also didn’t wanna go anywhere near the high-chair! So I started putting him on my lap, after he was done with finger food, and supplement with kinda of baby food (thick veggie and meat and cheese puree with small sized pasta mixed in, maybe one tbsp), and he was vomiting it. I noticed that everything was un-chewed. So we let him be for a few days, to see whether he’ll actually feed himself a full meal when he goes hungry. It’s been a week now, and, I swear that he’s lost weight. He doesn’t eat enough and then asks for milk. Today, for instance, when we got up at 8:30 he had opened the fridge (I don’t lock it anymore because sometimes he opens it and points at food that he wants) and, by the time I finished brushing my teeth, he had drank a 250 ml container of cow milk, a type that comes with a straw, which he hadn’t drank the night before. So we did a late breakfast at 10, lasted 1 and a half hour, during which he ate a 1 ounce chicken sausage, licked the cream cheese off a half a waffle, would touch the cheese sticks, and then I had to make him a green smoothie and spoon-feed it to him. Didn;t want any snack at noon. Lunch was at 3:30 since we had a doctor’s appointment, and he ate 1/3 of a maybe one ounce home made meatball, one slice of cheese, a very thin one, wouldn’t eat the rice and veggie patties or bread and half a cup of jogurt. 6:20 we had dinner as a family, he drank only the jogurt (its a thinner type, U can drink it from a cup), and nibbled on a cheese and spinach pitta (similar to pieroghi). We gave another try at dinner at 8:20 and I made the mistake of serving the fish finger and brownrice with peas together with a cup of milk. He drank the milk first, than ate perhaps 8 peas and a dozen grains of brown rice. Bit the fish finger only once. What should I do? Should I go back to supplementing with baby food. He will not chew it. Should I go back to thick purees? I don’t know what to do? In the meanwhile, he’s switched to an almost liquid diet. It sounds like you guys were on a good path and I am glad the strategies helped. I would focus on some of those crunchy foods and try to build off of what he is eating by making small changes. Keep foods small, flat, and as crunchy or crisp as possible. You can try to give him some purees still, but I wouldn’t focus on it too much because he is probably done with it. I would keep those textures smooth and really try to demonstrate how to chew with your mouth wide open. Keep things positive as well and try to get him back to sitting on his own. I’m so sorry you don’t have a lot of resources there. I do offer private, individualized consults, including an email option. You can find more info in the menu bar. It really sounds like there is some underlying issues going on here that need additional interventions. Unfortunately, I don’t really have any quick tricks other than you demonstrating with a wide open mouth. It does sound like he needs to learn to chew. If he never went through a stage when he mouthed on toys, encourage that now. Other than that, the strategies would need to be determined on an individual basis. I offer consultations, see the menu bar, or my previous response for some ideas to get specific individualized help. I wouldn’t give him any mixed textures, that is a much harder skill- either a smooth texture or the pieces individual- no lumps. I hope that helps! Thank you for your reply. I also wanted to add that few yesterday I gave him rotini pasta and he did manage to chew it but today when I gave him porridge with tiny carrot pieces he threw up. The carrot pieces were not chewed. I am so stressed and would like to change this (I understand it may not happen soon) how can I set up a consultation with you? I have emailed you and would love to set up something soon. Thank you again! I have a 20 month old and he eats Cheerios, bread, hummus, yogurt, strawberries, blueberries, grapes, chips, pasta, french fries, popcorn, roasted corn but he eats very very little of it and only sometimes. Could he have chewing/ swallowing issues or sensory issues? Please help because it breaks my heart to see him eat so little. It is certainly possible. If you are in the states you can get a free in home evaluation. Click on the Article Index in the menu bar and then look for Help for Infants and Toddlers for more information. I’m also available for private consultations. Let me know if you need any help! What to do with the veggie/meat issues? I’ve read some of those posts on picky eating, but I can’t get my 11 month old to eat most veggies so I give him that in purees still to make sure he gets those nutrients. He might stick in his mouth and then spit it out or he’ll just throw it on the floor to begin with. I’m scared to leave the purees because I want him to at least get veggies in some form. Hi Jen, these foods are often the most difficult for kids to eat for a variety of reasons. I actually wrote three posts on this very topic, which you can find in the article index in the menu bar. I would follow the steps in there and in the mean time it is okay to keep up with the baby food but I would make it really thick and even try making some homemade. Hello, I have gotten so much useful information on your blog! Thank you! We just had my daugter’s 9 month check up– her doctor made me worried that we are behind on table foods and that my daughter may have aversion to food. She picks up the puffs and cut up veggies but does not place them in her mouth. Also she does not hold her bottle instead she either pats it or places both of her hands behind her head like she has done since newborn. Along with sippy cups will hold them but will not place in her mouth to drink. Should I be worried or do you have any suggestions besides helping her move her hand to her mouth while eating and positioning her hands on her bottle and holding them there? I don’t think you need to be worried, all of this could be totally normal. However, I think it is good to be aware. You will want to watch these things and work them, but don’t put too much pressure on yourself. Sometimes babies just need some extra time to figure things out. If things don’t seem like they have improved at all in a month and you live in the states I would look into a free evaluation that is offered through your state. See my article index for the article: Help for Infants and Toddlers. As for the bottle, sometimes a bottle holder helps, here is a link to show you what I’m talking about. There are a lot of them. They are often helpful but it isn’t a 100% guarantee that it will work though. I would try making the pureed food very thin and maybe mixing with the blended fruits. I would also consider an evaluation just to rule out any possible issues with swallowing- a lot more goes into it than you may think. My other thought it that this may be sensory based. If you are in the states you would qualify for a free evaluation in your home. See my article, Help for Infants and Toddlers in the article index or let me know if you need more help. I would definitely avoid letting meals go much past 30 minutes. Try some bites of the difficult food and then switch to what he eats well. Also, have a drink handy to help him wash it down. I’m so thankful to have found your site! My daughter is 13.5 months old and I’m having trouble (like ooober frustrating, like makes me want to cry with her) transitioning her to table food. Just to be clear, she can and will eat quite a lot of things…namely CARBS. 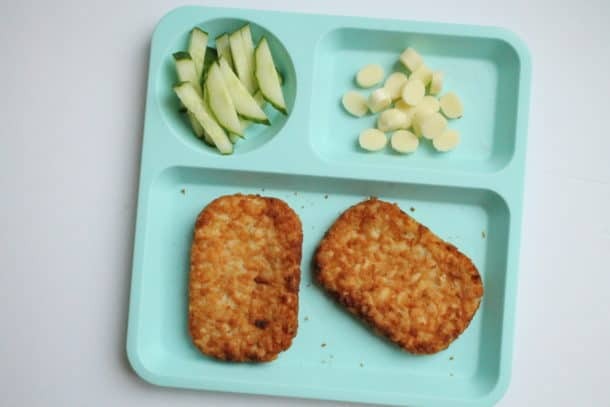 The child has absolutely no problem eating/chewing/etc anything like breads, Nutri Grain, puffs, the crunchies that look like cheezy poofs, cheezy poofs, Pretzels/tortilla chips (yes, I know they are no good, but I wanted to push the envelope on this carb thing to see what she could do!). These things do NOT have to be broken/cut smaller. She will start with the whole thing and eat off it. She will also eat bananas, cheese (shredded or chunks), all stage 2 baby foods, yogurt. Until a couple of weeks ago, when I tried to give her new things, she would gag and barf all over the table. Now she just spits it out. OK, here’s where it gets really good…my dad (an amazing baby whisperer type with 5 kids of his own) observed this and said he thought it was pure will driving the behavior. That I should let her get good and hungry and then she would eat. Well, he was right, sort of. She has eaten almost nothing for 3 days now. When she does get good and hungry, she will eat sweet potatoes and apple pieces (cooked). I offer these and some combo of peas, green beans, carrots, cantaloupe at EVERY MEAL, only giving her a bowl of oatmeal mixed w baby food at bedtime, and a 6oz milk bottle when she first wakes and goes to bed. Through this I know she can successfully chew and swallow the sw potatoes and apples. No gagging at all. The only other success is at snack yesterday, I gave all the kids fruit cocktail. She ate the grapes, cherries, peaches, and pears (I left out the pineapple) with only a little choking on a hard pear piece. She wants what everyone else has, but can’t handle it. And she mostly just wants the carb things. Her will is strong, but so is mine. I want to help her through this, but the right way! HELP!! Hi Alessly, this is an interesting situation. First I have to say that I would never under any circumstances say don’t feed your child. There are so many complex underlying issues that could be making it difficult for your child (see my post on 5 reasons kids don’t eat in the sidebar). See my Eating Basics in the menu bar for more on this. However, you really aren’t starving her as you giving her milk and food at the beginning and end of the day. Also, I never want to tell a parent to go against their instincts. If you give her the carb things just moderate how much and try to get her interacting with the other food at least. I would also focus on some sensory bins, there is a link in the post above. With this small amount of information it does sound like there is some sensory stuff going on here. I would use this post as a guide and try to implement as much as you can. I don’t want to overwhelm you, but there are so many articles here that will be in much more detail than this comment see the Article Index in the menu bar and start poking around. Please let me know if you need more help! Actually, I meant see the post Turning My Picky Eater Around, if you hit home now it is the most recent post or you can find it in the article index! Thank you for this post! My son is 13 months and he was starting to eat more table food, but now he won’t try anything! He eats graham crackers, Cheerios, and sometimes bananas. I know it’s not an issue with chewing since I know he can do it. It doesn’t seem to be an issue with texture because he won’t even put it in his mouth and try. Any other suggestions? Hi Kellie, first just because it doesn’t go to his mouth doesn’t mean it isn’t texture. Sometimes they are so unsure of the texture they don’t even like to look at or touch it- that may not be what is going on here but I wouldn’t rule it out just yet. I would focus on what he is eating and make small changes, try other types of crackers and dry cereals to start. Also, cut bananas into different shapes and present these preferred foods with other foods that he is refusing. Around this age taste buds really start to develop as well, which is why he may have become more selective. If it persists let me know. Hi I’m in the UK but stumbled upon this site whilst trying to find a solution to my 22 month old girls eating issues. She eats stage 3 jars no problems (doesn’t even seem to chew it, just straight down the hatch). She’ll eat some finger foods, crisps, fries, biscuits, crumpets, chocolate, bananas, and will eat from our forks at meal times (mashed potatoes, carrots, chicken etc). As a 12 month old she would eat fingers of cheese spread sandwiches, small pieces of tomato etc by herself but this has stopped flat. Screams bloody murder if you try to offer her table foods as her meal. Really struggling to get her off jars and back to table foods. Tried making my own foods with baby pasta and tomato sauce, again screamed the place down. Help?? She was tongue tied but this was snipped at 7 weeks. As I say she happily eat snacky foods such as chips, crisps, fries etc and jars but not table foods at meal times. Thanks for listening. I would slowly mix in some of those homemade varieties to start or at a minimum add some seasonings or olive oil in small amounts to the food she prefers. I have a feeling she may not be chewing food well. Really try to demonstrate this for her and have her imitate sticking her tongue out and making silly noises with it. It may be weak or not have good coordination. Also, build on what she is eating well, make small changes by buying different brands and flavors of food. Seperate question…..he drinks water from a straw cup pretty well. At his 3 pm snack I’ve been offering his formula in a sippy cup. It’s a soft spot one. Is this ok? Should it be a different type of cup or also a straw cup? Transission is challenging and I feel like I’m drowning lol. It’s supposed to be fun but I’m overthinking things and don’t have a lot of places to look for advice. Thanks again! It is okay, I understand. Forgive my late responses- I was on vacation and have back logged! Anyways, at his age the sippy cup is fine, by one year I’d like to see him without it- ideally. Don’t make yourself crazy though. Still give him opportunities to drink through the straw though. The soft spout is fine but the next time you buy one go for a smaller hard shaped variety. Can you help me. My son is 9.5 months old. I have been slowly giving him chunkier purée. He can totally eat puffs and Cheerios and baby mum mum cookies with little to no issue. We have tried some finger foods such as well cooked pasta, super moist baby mestballs. My issue is he cries at a lot if meals:(. Even with purée he has been known to cry. I notice with the more sokid foods he will try to self feed a few pieces and the rest I offer in a spoon and he eventually cries and is looking for purée. He loves purée as he can continually shovel it in. He holds food in his cheeks and then can’t figure out how to et it iut. It’s hard and frustrating. I feel like I’m offering the same things continually and have zero creativity as I’m afraid he won’t eat something or be upset thru the entire meal. He had a formula bottle after his breakfast and lunch. Another one at 3 with a snack. And then bedtime. Snack is usually some sort of cracker or puff etc with some fruit lately raspberries he likes and will feed himself. It is okay to keep focusing on puree at his age. It is more important to keep it positive. Slowly introduce and back off when you see his attitude starting to change. It sounds like he “may” have some underlying issues going on. I would consider a free early intervention evaluation, just to make sure. Demonstrate with a wide open mouth on how to chew and use your finger to quickly sweep his cheeks out when he pockets the food. Give LOTS of positive reinforcement whenever he does something good no matter how small. I know it is so frustrating. As I talk about in this post it is really hard for some kids to transition to mixed foods, which is what stage 3 is. For the time being I would avoid it and work more on his chewing skills. Keep mealtimes positive and relaxed. See my article index and eating basics in the menu bar for a ton of ideas on this. Also, in the article index look for the article “help for infants and toddlers: early intervention”, assuming you are in the states. I would highly recommend a feeding eval, he may have some underlying issues. If you don’t want to go that route, please don’t hesitate to contact me for an individual consult (also in the menu bar). Of course, let me know if you have any other questions! Interest in eating is awesome! Keep trying. I’m glad you discussed your concerns with your pediatrician, if they persist bring it up again and be persistent. Many pediatricians don’t have much experience with feeding and only can base what they see on how they are growing. In the mean time focus on those foods that I talk about in these posts, they will be the easiest for him to eat. You are doing a great job! Oh I have a whole post on that, see the side bar under popular posts or the article index in the menu bar at the top. It is called Mega list of baby and toddler foods. Think of cooked potatoes, noodles, soft pizza, tortilla shell, fish, etc., just to name a few. Let me know if you need more help! Hey! I am just looking for some advice. My 11.5 month old seems to be making transitions without me and I’m not sure how to proceed. She was never a picky eater…loved every puree I gave her and is really good with textures from a spoon. Recently she has largely refused all food from a spoon – even things she always loved. I have found that if I let her play with something, sometimes she’ll open her mouth for a spoonful, but it’s very inconsistent. And it seems she’s not in to textures if she has to feed herself. She’ll eat cheetos and cheese and peas, but nothing squishy. Even things I know she likes (like avocado or blueberries). It’s making me very paranoid that she’s not getting the nutrition she needs but I don’t want to make meal times a negative experience! I don’t know how to move from here..
By the way, as clarification..
Hi Jessica! Sorry, for just responding as I just saw this. As you’ve read I’d be trying to move away from baby food. It sounds like she wants to be done anyways. I would also avoid toys at the table, I know it works not, but trust me it can turn into a monster. Try to build off of what she is eating well and slowly build a bridge to new foods. In the article index see in the menu bar see: Picky Eating Tips- Expand on What They are Eating, and Exploring New Foods. If this problem has persisted I would also consider an eval, see the article Help for Babies and Toddlers. I hope that helps and let me know if you need anything else! Thank you, this is very helpful. I have an almost 1 year old, and she used to eat puree like a champ. She’d eat 3 jars at each meal. Now that I have been trying to move to table food, I’m finding it very hard. She tries to put everything in her mouth at once and often I still see the food in her mouth minutes after she puts it in. So, now I sit there and dole out a piece at a time and wait for her to swallow. I don’t think she really chews either, so it’s very disconcerting. I have come to dread mealtimes, it takes forever now! And I’m terrified of her choking since I think she tends to swallow whole and she tends to cough as she’s eating. Is this normal? I’m wracking my brain for foods for her to make a meal of that are very easy to swallow so my go to’s are yogurt, oatmeal, soft ravioli pieces, scrambled eggs, etc. I would say there are some red flags here and that your instincts are right. She probably isn’t chewing and anything more than an occasional cough is unusual. I’m glad she is motivated to eat, but refer back to these posts and follow steps to show her how to chew. Put food on her gums where she should be chewing. I would also recommend getting a feeding eval- don’t worry that isn’t as scary as it sounds. I’m also available for consults- no pressure- if you want to come up with a specific plan for her. If you are in the states see the article index and look for the post: Early Intervention. This will tell you how to get a free in home eval. If you need any help with this let me know! 1. She will eat pretty much any cubed table food we give her, as long as we put it in her mouth. She has a great pincher grasp and will play with the food all day, but she will not bring the food to her mouth by herself. She even fusses if we put her hand to her mouth. 2. I did some reading and found that a good table food portion size is 1 tbsp per food group at a meal. She will only eat about 1/3 to 1/2 of that before she starts screaming and doesn’t want anymore. 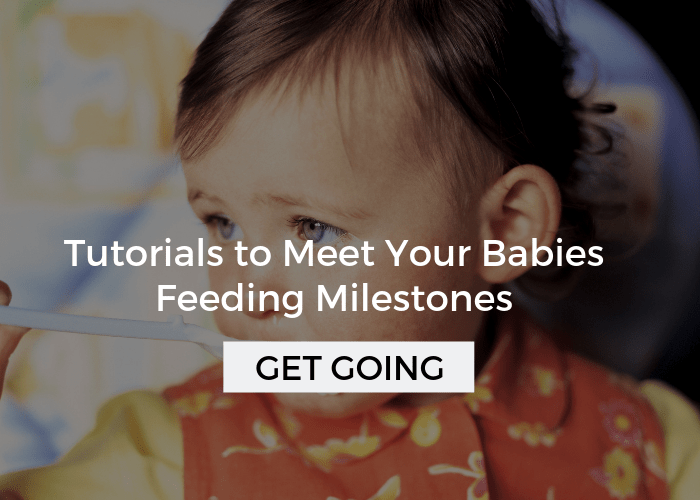 Should I follow up with baby food to be sure she’s eating enough? 3. She’s now on all cow’s milk, and we’re giving it to her after she’s finished each meal. She was drinking around 32 oz. of formula per day before we transitioned her to cow’s milk. The recommended daily intake of cow’s milk is only around 16-20 oz., and she wants far more milk than she’s getting, especially at nighttime. Should we give her more? She’ll drink small amounts of water but is not very fond of it. Your blog is extremely informative, and any advice you could give is greatly appreciated. Thanks so much. Hi Sarah, I would definitely recommend cutting back on her milk wherever you can. You wouldn’t believe how much that can fill their little tummies. It is most likely that she just needs to learn to eat more at meals. Give her lots of praise when she eats something and try to change up the environment if you can. Have someone else feed her, move her high chair. This will help her get out of her habit of throwing a fit. I would temporarily give the baby food, but really be trying to move away from it- don’t use it as a crutch. See the most recent post: Toddler portion sizes. It really is important to trust them in their appetite. This will also teach her that she needs to eat when the food is there. I have been reading your blog since last night and the first thing i went to this morning when my son went down for his nap. It is so amazing and you give such great advice! We have been having such a difficult time with drinking and eating. My son just turned 1 and has never been a great drinker, from a bottle. He can do it, he just will drink 1 or 2 oz at a time and then stop and push it away and we keep have to encouraging him to drink. Now that he is 1, a whole new problem with sippy cups, or actually the same problem. I wouldnt be so concerned, if he was eating more, but that seems to have also slowed down. The worst is breakfast. When he wakes up, I give him some time and then offer a 4 oz bottle, he will take maybe 2 oz with encouragement and will not touch any food…today however he wanted nothing to do with drinking out of a bottle or sippy, but did eat some cheerios in milk, that I fed to him. I am so lost about what to do. He will eat a few bites of things during the day and definitely does better if I feed him, but by no means is he eating “meals” and only consuming maybe 4-5 oz of any liquid independently. Therefore I feel like I need to rely on feeding him a bottle before nap and bed to compensate. I feel like picky eating is “normal” but not drinking too?? I am stumped…. Thank you so much- I’m so glad your kid’s table has been helpful! It sounds like there may be some underlying difficulties- I can’t be sure of course, but maybe muscle weakness or he could be tongue tied? I always try to give parents at least one tangible thing they can do, but in this case that is really challenging without more info. Are you in the states? He would qualify for a free feeding eval, and I am available for consults as well- no pressure though. Email me if you have more questions. Hi! Thanks so much for getting back to me. He seems to have the muscle strength and the doc has never mentioned anything abt being tongue tied. We are supposed to have an eval with EI in a couple weeks. Originally I had called EI, because it was more of a motor skill concern, he is unable to sit up from laying down on his own and not crawling. I understand all kids progress differently in that area, so I wanted to wait until he was 1 to see if there were any changes. He seems to be reaching for things better while in a sitting position, however if I put him on his belly, he usually just screams until I pick him up. I really try to work with him, but he gets very upset with any tummy time activities. He is very good with his hands, can stack rings and cups and get a snack out of the little munchkin cup, but the gross motor skill is where he refuses to try. He can also stand and hold onto something every well if I put him in that position, however he will not pull up to get in that position. Well that is just a little piece of where we are right now with the gross motor skills. after that he turned his head and started to get upset. after being up for a couple hrs, I offered him 3 more oz of milk in a bottle. He drank 1 oz laying on a pillow. (He has never drank a bottle sitting up). tried all different kinds of sippy, straw, regular cup etc…but nothing seems to work so far. even the bottle. I was going to try rice milk today to see if it is a taste thing? He can also hold up a sippy cup with handles, he just doesnt want to drink from it. I would love to discuss more with you about a consult. on as side note, on a whim, today I gave my son rice milk, which he actually drank 3oz out of a sippy cup! and also ate some cottage cheese and fruit when he got up from his nap. Do you think it is the taste of the milk that could be the issue? Are there any major reason why I should not give rice milk as long as I make sure he is getting enough calcium/vit D from other sources? this was much more of a success than with formula or milk or mixed… but not sure I should give up on the cows milk so easily?? Right I wouldn’t give up on cow’s milk so easily- there is so much fat in there is great for brain development, but the rice milk is an option. Glad you are getting an eval- I think it will be helpful for you. You should get lots of info, plus strategies to get things going in the right direction. If you would like a consult, I’d love to talk in more detail. There is a tab in the menu bar at the top or you can email me at [email protected] Either way, let me know how it all goes! Thank you! I just sent you and email now. I’m having a difficult time feeding my 13 month with the transition to table foods and I was thankful to read your blog today. Over the past week, my LO has slowly made progress in eating new foods such as bananas and string cheese. Interestingly enough, he does not like to eat cubed pieces of food. Instead, I give him half of a banana or 1/3 of string cheese that he can hold in his hand and gnaw on. He’ll also take bites of apple slices and then spit it out. But since he is selective with his table foods, I’m still feeding him baby jar food too. Today, I tried offering him several different table foods for lunch: steamed diced veggies, shredded chicken, cooked chicken slices, and cucumber sticks – all which ended up on the floor. 🙁 I know the transition will take time but at times I feel horrible for feeding my LO so many processed snacks (Mum Mums, cheerios, baby crackers, graham crackers, goldfish). I am happy to report that we have had some progress. I eliminated his puree/mashed up food at dinner, and gave him some boiled egg. He ate only the whites, while dipping in ketchup and some in chocolate sauce. I have been consistently presenting that option for dinner for a week now. Most days are okay. One or two days he didnt want any food. He eats a couple pieces himself, then i have to help. Do you have any idea about portion size for a 19 month old. I know this varies ofcourse – each child is wonderfully unique. But any general guidelines? Is one boiled egg enough for a meal? That’s great! Generally speaking kids need 1 tablespoon of a protein, a carb, and a fruit or veggie at each meal for every year of their age. So a 2 year old would need 2 tbsp of each, I would give your son 1 and 1/2, assuming there is 4-5 meals a day (that includes snacks). One egg is more than enough protein, hummus is also a protein. Does that make sense? Thank you so much for your response. I will read up on the articles and links you mentioned. I tried Coco Pops with him and they were a bit of a success. He ate a couple and then chewed and spat out some (same thing that he does with other foods). He also eat at his high chair (and yes, we have the iPad on). I keep offering the pieces of food, even as I feed him Puree in case he decides to eat. He will eat anything sweet, but again – things like custard, melted ice-cream etc. Let me read the links and see if I can work things here with my son, and will get back to you. Thank you again Alisha, for all your advice and help! Thanks so much for all of this information. I am having the most difficult time feeding my 20 month old son. He eats two or three pieces of cut up diced food (on the good days), otherwise i still have to puree his food. And then if the puree food is to lumpy, he will gag and throw up. I tried to introduced table food when he turned a year old, and we had so many weeks where he would just gag and throw up. It was traumatic! And i backed off, went back to puree foods. For the last few weeks he’s also rejecting the puree foods (he had a notorious ear infection, but hes okay now). He also lost some weight as a result of the loss of appetite from his meds while recovering from the ear infection. As i mentioned earlier, he will eat maybe three of four diced up small pieced of carrots of potato. But its rare. He enjoys grapes and coco puffs – but thats really it. I am loosing my mind. Your advice would be valuable! Hi rp- are you in the states? I have a lot of helpful info on here, but I would recommend getting him a feeding eval. Your state is required to offer a free early intervention program for such issues. I can help you more with that. I am also available for consults- see the top menu bar. It sounds like there are some underlying issues going on, which I see very commonly- so you are not alone! Take it slow and try to give him scrunchy foods that melt right away. He has to get use to textures and chewing slowly. Keep things as positive as possible. Please let me know if I can help anymore! Oh, there is also an article index in the top menu as well. 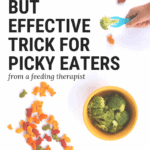 See the title picky eater and check out 5 Reasons Why Kids Don’t Eat. That will help you to get started. This is very helpful. My 10.5 month old mostly wants to feed himself but his pincer isn’t very good yet so he struggles – especially with food that is slippery or small (the right size for him to eat). Then he gets frustrated and won’t eat at all. Once in a while though, he only wants to be fed and more often doesn’t want to eat what he usually likes. Any advice would be great. Thanks! Yes, this is very typical. Put some down on his tray for him to try and feed himself, but you can feed him too so that he doesn’t get frustrated. Try to focus on some drier food for him to pick up on his own. You can also hold up the piece of food for him to grab one at a time, which will really help with his pincer grasp. Keep trying he will get there! Let me know how it goes! Candice- keep me posted! There is a lot of information so take your time and let me know if I can be of any other help! Thanks for the ideas in this blog. I have a 13 month old that will eat yogurt and any puff, cracker, creal bar, cookie (etc.) that you put in front of her but basically refuses any other type of table food. She will eat stage 3 foods with pasta in them but will not touch it stand-alone. We’ve recently started her on dipping her little cookies/biscuits in her yogurt so hoping she would be more inclined to explore more additional foods herself, but it is a slow going process. I have noticed that she is inclined to play with the food more if she thinks we are not watching her at all….is that typical? Yes, it is typical! Try to eat together as a family and not to make her the center of the meal, sometimes that adds pressure and that may be why she does some things while your not looking. 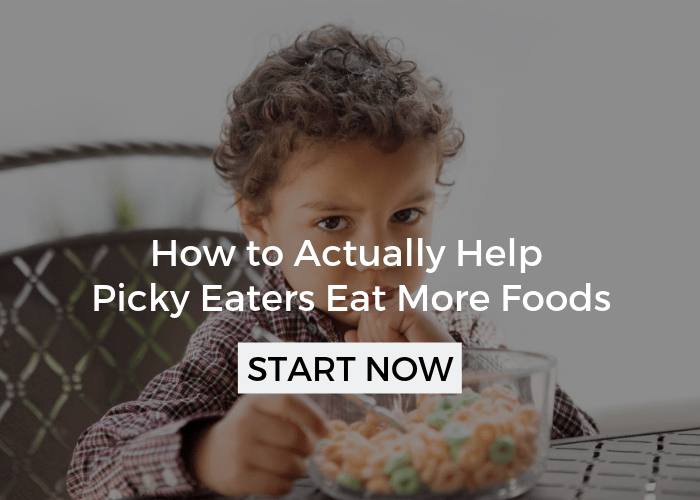 Make sure you look at “picky eater tip: expand on what your kid is eating”. There is a new tab in the top menu that says “article index”… you can find everything there! Good luck and let me know how it is going! He will occasionally eat cut up adult food, such as diced meatballs or apples, but this is relatively rare. He often refuses to put pieces of things into his mouth, and if he allows us to put something into his mouth, it often comes back out. We have tried all kinds of different foods served this way with little success. He does not have molars yet. Is this relevant? No, the molars wouldn’t have anything to do with it, that is a common misconception. He is able to chew most foods with his gums. To get him to eat more table foods, build off of what he is already eating. Try other flavors of cheerios, other brands of pretzels. Try other toppings on bread like hummus or cream cheese. Does that make sense? We had a huge breakthrough this weekend — he ate a whole meal by himself! White beans, diced roasted squash, and a whole wheat apple mini muffin. I don’t know whether it will last, but it’s certainly very encouraging! I am so thankful to have found this blog. My 14 month old son is great when it comes to pureed foods — he’ll eat nearly anything as long as it’s all or mostly pureed. We continue to offer him pieces of food, usually at the beginning of each meal, but so far he has shown very little interest (except cheerios!). Do you have any advice for guiding him towards self-feeding? Thank you, Karin. Since, he is still on purees try giving him a small bowl while you are feeding him with his own food. Then, dip his hand into the puree and take it to his mouth. This may seem a little foreign to him, so keep trying if he is a little reluctant. Even though this isn’t a finger food it will help him get the idea that he can take food to him mouth himself. Once he gets the hang of that, then start to take his hand to the cheerios. Also, try modeling it for him. I hope that helps! Let me know how it goes! Great to read your suggestions! My son is 10 1/2 m o and isn’t fussy when eating but likes me to place the food in his mouth! Will feed himself with rice snacks & biscuits but picks up everything else & throws it on the ground. Very frustrating!! Maybe I just need to keep trying (over 12 times) and at every meal like you suggested. Yes, Megan, keep trying! Buy different brands/flavors or similar products to the rice snacks and biscuits to try and build on what he is already eating. This will help him start to branch out a little more. Sometimes, babes go through that phase of throwing everything on the floor. Keep trying to give him a few pieces of foods he likes and tell him “no” when he throws. He will get the hang of it! Thank you for this blog! I just found you the other day and you have some great posts! I was especially excited to see the Part 2 of this post today and am looking forward to trying some of your tips with my son. He is 17 months and does good with certain table foods. Mainly ones that have a dry texture, but when it comes to cold or squishy textures he won’t touch them and will even refuse if we try to feed him them. We also have some other feeding issues, but I won’t write a novel. It’s been frustrating, but I am thankful to have found your blog and the advice and the peace of mind it offers! Thank you so much! I see the avoidance of squishy textures all the time. Another tip, break it down, and give those things mixed in with other foods. For instance, warm up pasta salad and put small pieces of cheese in it… that is if he eats noodles. But, the idea is to mix it in with things he likes, slowly! Great idea! He not into the noodles yet, but he likes the little star shaped pasta mixed with mixed veggie stage 3 baby food, as long as I feed it to him. Maybe I can try this idea with that. Thank you!